It was another frustrating performance from the Roy, who again were left to rue their inability to convert chances into goals. In an even opening period, the Roy went close with a Scott Forrester header from a Gavin Mackie cross before Adam Forde broke down the right for Pollok, but his cross in to Stuart McCann was well cleared by the Rabs’ defence. On 10 minutes Rob Roy’s new striker Alex Cassells fired wide and then four minutes later Lee Gallacher cut in from the right to fire a low shot to keeper Scott Johnson’s left hand side which brought out a fine save as he pushed the ball wide for a corner. The Roy then had a strong claim for a penalty kick turned down when it appeared a Pollok defender had used his hand to control the ball at the back post, bringing outrage from the Rob Roy dugout. Martin McBride then made a great saving tackle from a Pollok breakaway before Bryan Young went close with a snap shot from 18 yards. Nevertheless the visitors took a 22nd minute lead. Young’s corner was headed back across goal and when keeper Craig Gordon parried the ball it fell to Grant Evans to blast the ball home from a few yards. With both defences on top play was confined to midfield with the wet surface making matters difficult. Graeme Ramage then saw his effort from 20 yards go wide and at the other end the Rabs’ defence cleared McCann’s dangerous cross as the visitors went into the break still a goal ahead. Early in the second half Gary Carroll broke through the Pollok defence and from Gallacher’s cross keeper Johnson spilled the ball but there was no one there to capitalise. Forde then had a great strike from a free-kick that went just wide before the Roy brought on Willie Sawyers to replace Cassells and he made an immediate impact unsettling the ‘Lok defence. 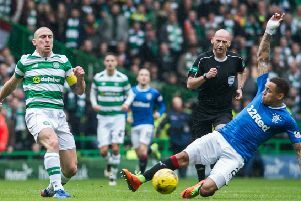 However the visitors were still dangerous on the break and a Young free-kick was headed on by Paul Gallacher but Gordon made a fine save. The keeper was again in action minutes later saving McCann’s point blank shot. Jamie Henry sent a shot high and wide after some neat play and then the Rabs’ defence did well to clear from Forde. Joe Slattery saw his goalbound shot blocked before substitute Connor Hughes had a chance to equalise but from a Carroll cross his header lacked conviction and caused no problem for Johnson. 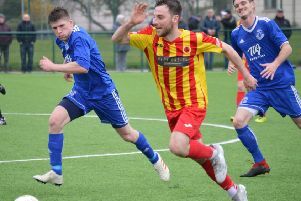 Rabs were then reduced to ten men when Lewis Kinnaird brought down Shaun Fraser just outside the penalty box as the former Rob Roy player ran in on goal, and referee Doherty showed a straight red card. In the latter stages Rob Roy pushed forward and from a short Gallacher corner, McBride drove the ball over the Pollok bar from the edge of the box. With two minutes remaining, Ramage’s long throw in was well cleared by the ‘Lok defence before finally clearing a Gallacher cross in stoppage time to run out single goal winners.